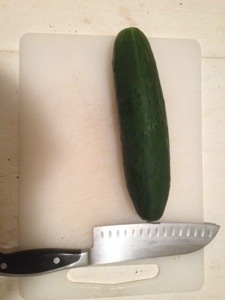 Growing up I always loved to make cucumber sandwiches. They were so good and so refreshing. 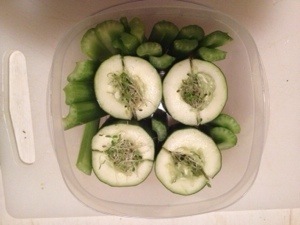 Looking up lunch ideas I came across these cute cucumber sandwiches sans bread. 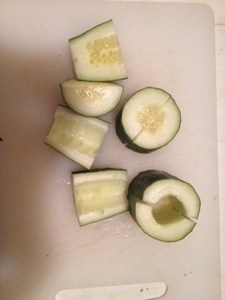 Take your cucumber and cut it in 3-4 pieces then cut in half. Use a spoon to scoop out the seeds and throw the seeds in your composter. 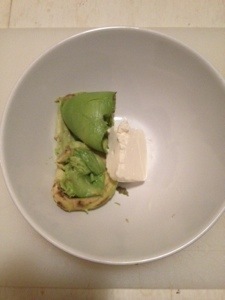 Mash up avocado and optional cream cheese. I used hummus for my second batch. 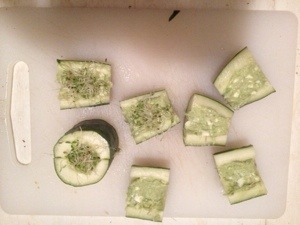 Scoop filling into both sides of cucumber and toss some sprouts on top. Put both sides together to make your sandwich. Here’s the finished product. As you can see I added some celery, it serves two purposes- snack and to help the sandwiches from not moving around. You can certainly eat these whole but since I am the most ungraceful eater ill just eat them as halves. I never even thought that I should be soaking my nuts overnight. Here is an article Deidre (holistic nutritionist) sent to me. Nature has set it up so that the nut, grain and seed may survive until proper growing conditions are present. Nature’s defense mechanism includes nutritional inhibitors and toxic substances that can be removed naturally when there is enough precipitation to sustain a new plant after the nut, grain or seed germinates. When it rains the nut, grain or seed gets wet and can then germinate to produce a plant. So we are mimicking nature when we soak our nuts, grains and seeds. What can be used to soak nuts, grains and seeds? I have enjoyed almonds wet. If you choose to try consuming anything in the soaked state, make little batches and store them in the refrigerator. Usually everything that is soaked is dried in a dehydrator or oven on the lowest possible setting for 24 – 48 hours to remove all moisture. Maureen Diaz recommends soaking any beans or legumes in water and vinegar for at least twelve hours before cooking. Soaked and dried beans may be ground up and used as flour for thickening and baking. This is helpful for those on a gluten free diet. Humpday-Cabbage, Carrots, & Rice! Oh My! 4 days into my gut healing process and I feel so good. My morning routine swayed slightly. I bought a package of the Vega protein shake at the store and decided to give it a whirl. I really liked that it was thicker in consistency. At first taste all I could taste was artificial sweetener. It was strange. The surface of my tongue got numb feeling and it tasted exactly like that artificial sweeter you can taste in ‘diet’ drinks or ‘no sugar added’ items. Could it be the Stevia extract? Stevia is definitely not artificial. I’m really not sure what I was tasting in this shake but It had me so thirsty. After drinking the shake I had to down 2 large water bottles before the thirst subsided. Matt decided to try out a concoction of his own with the sprouted brown rice protein powder we already bought last Saturday. He added a frozen banana and also melted the coconut oil like I did yesterday. Curious about his concoction I took a teenie sip. Not knowing if I could have banana I though a sip would be best. It was surprisingly tasty! I couldn’t believe that a simple banana could alter a taste that much! This trick will definitely make this shake more tolerable. For lunch it was Matt’s turn to make lunch. He made a veggie soup. He used veggie broth and chopped up cabbage to look like noodles. He added cooked onion, carrots, and asparagus. It was delish. Quick, Easy, and Frugal! I got a cucumber roll and an avocado roll. I know I shouldn’t have because the mirin in the rice but I needed to spice things up a bit. I did not have soy sauce and it did take me from 6-9 to eat it all. I was not hungry today. I had nuts for snack at 1030 and 230 and that had me quite content. I knew I had to eat more so I ate all the sushi but I could have been fine without it. So that’s It for today. Its 11:30 and I’m ready for sleep! Do you drink protein shakes? what are your favorite brands? have you tried Vega? What were your thoughts? This rice casserole is meant for those recovering from an ulcer. It contains the safest ulcer friendly foods. If you do not have an ulcer feel free to add other veggies and spices/herbs as you wish. Heat oil in a deep pan or pot. add zucchini and cabbage and saute for a min or so. Add the rice and the broth and bring to a light boil over Med heat. Turn heat on lo and simmer for 15 min or until rice is cooked. So today I woke up with residual headache from yesterday. I woke up and did my new morning routine and felt better. Today, in an attempt to make my protein shake better I added my sealicious omega fish oil to my shake. 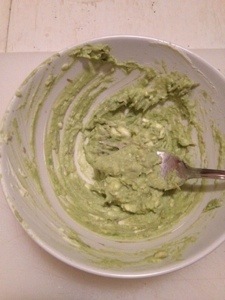 It is flavored with lime (only one I found) and did find it masked the taste a bit. I think the chunkiness is coming from the coconut oil. It is solid at room temperature and so when I put my almond milk from the fridge into the blender the coconut oil just stays solid. It’s unappetizing having chunks and the top of your protein shake but I’m determined to make it better. Ill try and warm up the oil and use room temperature almond milk. I started work at 12 today so I had time to make lunch and dinner. With last nights fail and rice casserole I was determined to make this batch work. Lucky for me I succeeded. 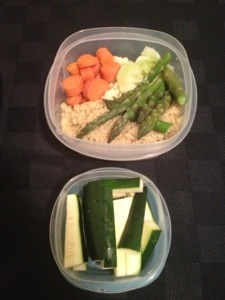 I packed zucchini sticks and almonds for my snacks and the rice dish for lunch and dinner. I was finding myself really hungry soon after eating lunch and dinner. I have to make sure to pack some more snacks. When I got home I had steamed 3 carrots (cut in sticks) to eat. It was about 8 and was not planning on eating this late but I had to. As Im writing this I’m still really hungry. I’ll find a good balance eventually. Today was a good day Overall. Although Ive had a migraine, failed attempt at rice casserole and always hungry I’m optimistic. I know this will go away and I will be so much better. I am One lucky gal and I’m so thankful for the love and support from my family and friends. My loving Mother reads all my posts and emails me about them as soon as she reads them. It makes me happy that she takes the time to read what I write and get caught up with what I’m doing. I’m blessed to have her as my Mom. My mom was also my inspiration to knit. She knits a lot and is very good. Last mothers day I taught myself how to knit. As a mothers day surprise I knitted her a set of dish clothes for her kitchen. Since then Ive found joy in knitting. I have not done it in a while so today I picked up my knitting needles and am starting to make a coffee cozy. It helps me relax so this is what I did for myself today. How have you taken time for yourself recently? I was supposed to post this yesterday but ill soon get to why I did not. I woke up optimistic on Sunday morning at 7 am. I bought everything I needed at planet organic and thrifty foods on Saturday. Matt and I both had to go to work so we worked together to get the day going. I had made lunch the night before so he made the shakes in the morning. After some sealicious omega fish oil breakfast was done. Overall not so bad. I work at the salon today so here is what I packed. I did bring almonds and cashews but they were soaking while I took this picture. At snack time (before and after lunch) I had 1/4 cup of almonds and cashews and half of a zucchini made into sticks. For lunch it was about a cup and a half of quinoa, steamed asparagus, carrots and cabbage. It was pretty good. Afterwards, I asked about eating the quinoa and learned that for my stomach at this time it would be too complex to digest so I’m going to stick with rice from now on. Unfortunately at work around 130 I started to get really hungry. 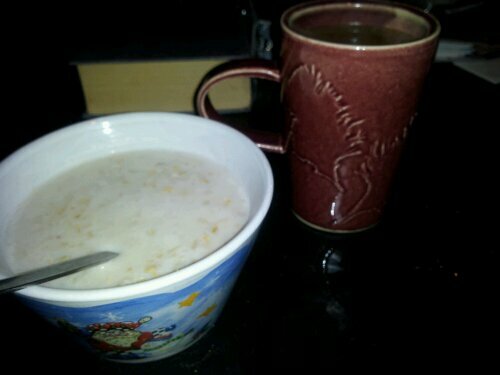 I had the Rest of my snacks and had herbal tea. This did nothing. I finished work at 5 but seemed to get hungrier and hungrier to the pointe of getting a migraine. My coworker drove me home but stopped at the store first. I decided to get 85%cocoa bar. I had a 2 squares in hopes to get better but did not. Home came pretty quick and decided to look up some more substantial recipes with my allowed foods for this 10 day stomach healing diet for an ulcer. Spinach rice casserole! Sounds yummy, i omitted spinach for cabbage and got some veggie broth. I’ll post this recipe and have the link here when I post it. I got to the part where it’s supposed to simmer, lucky Matt came home so I said “can you set a timer for 15min then can you serve it up?” And as the sweetheart he is he obliged. 15 min came and it was burnt!!! With this migraine I neglected to think to turn the burner on low to simmer. Damn it, not my finest culinary moment. I ate most of it anyway. I was so hungry and wanted to eat. After that I fell asleep and slept well. This post was supposed to be done last night but as you could understand it did not get done. I woke up with a mild headache but water and my morning routine fixed it pretty well. I’m so thankful for my friend whose given me all this information and taking the time to help me out. Without her I don’t know what I could have done. I’m on a road to really understanding what my body needs. I’m also so thankful for Matt. He knows exactly what I need and just does it without me asking. He makes sure I am comfortable when in pain and does everything to help me out. He is so caring and loving. I’m so thankful he is part of my life. I think that today I was nice to myself by starting the journey. I’m starting to listen to my body and giving it what it wants. I still have lots to learn but starting somewhere is the start. Have you ever suffered from an ulcer before? What were the steps you took to heal? I am throughly enjoying sitting here writing this post on my phone. I sat down to do some choreography just in time for our reliable internet (through Telus) not to work….for the 3rd time in an hour. Does anyone else have this issue with them?? Today was pretty uneventful. I did a bit of packing this morning. 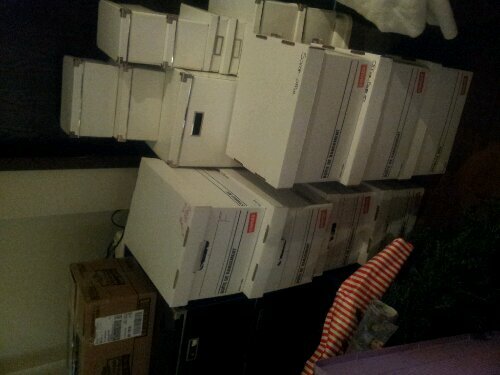 Most of our life is in boxes at the moment. We have so much stuff! I know right! Im living on the edge! I also paired this with a coffee and some Girls Aloud.